That's worth repeating. Thorough research is not a search for the one document that answers a specific question and no conclusion should ever be based on only one document. Understanding this, every effort has been made to thoroughly research the lives of Rider Fields and Katie Vann. Not only were the documents and records made during their lifetimes reviewed, but also some that were created after they both died. Ben Vann was not the only living child of Katie Vann at the time of allotment. Martha Johnson and Chick Vann, sisters of Ben, both applied and were enrolled by the Dawes Commission. One would expect the information they gave on their mother to match the information Ben provided about her. It didn't. Martha Johnson, Ben's sister, listed George Fields, not Rider Fields, as the owner of her mother. Was this George Fields the father of Rider? It's possible, but there were several Cherokee men named George Fields so we don't know. 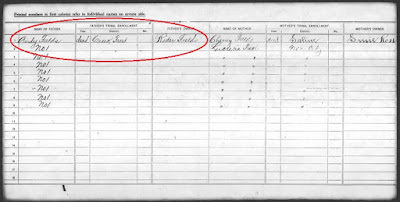 What we do know is Martha indicated her mother was a slave and that she was owned by someone other than Rider Fields. 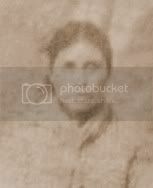 Chick Vann, another sister of Ben Vann, said Katie Vann (daughter of Ave Vann and Cherokee by blood) was the owner of her mother, Katie Vann, a slave. The siblings agree that Ave Vann or his daughter Katie was the owner of their father but the name of their mother's owner is still in question. While neither of Ben's sisters gave information that would support the answers of each other, neither offered information that supported the answer Ben gave either. 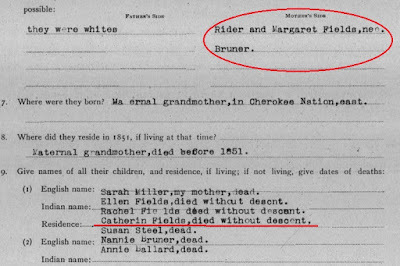 Results from the exhaustive search indicated Catherine Fields, daughter of Rider Fields, was listed by name in only one record during her lifetime. Despite this, we do have additional information on her. 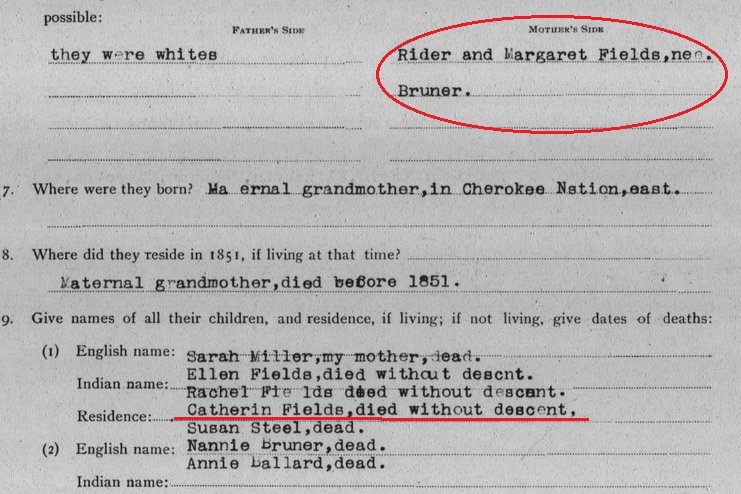 She is mentioned in at least three Eastern Cherokee applications filed by the grandchildren of Rider Fields. Randolph Ballard, Susie Mayes, and Elizabeth Montgall included Catherine Fields as a sibling to their parent and said she died without descent. 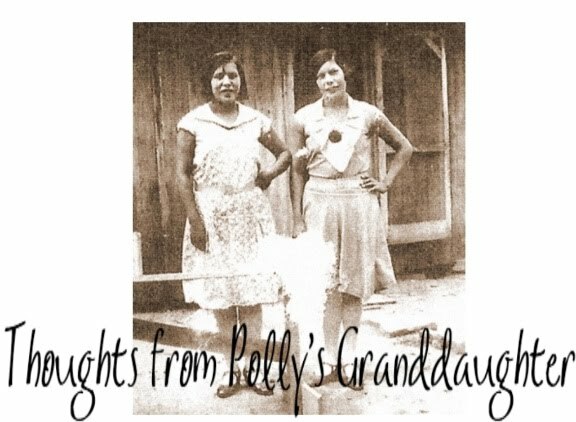 These grandchildren descended from two different daughters of Rider Fields and grew up in different nations; one in the Creek Nation, the others in the Cherokee Nation, yet the information they individually provided on Catherine Fields is corroborated by the others. Catherine Fields never had children. 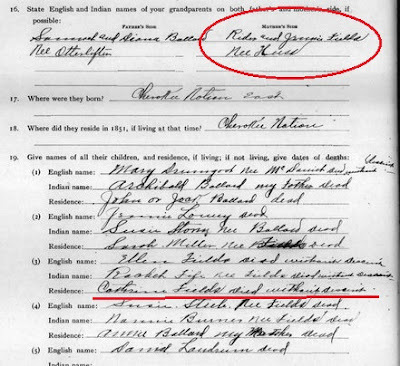 This makes it clear that Catherine Fields, daughter of Rider Fields, was not the same person as Katie Vann, the slave and mother of Ben Vann. Rider Fields has no descendants through his daughter Catherine. Rider Fields did own slaves. One was named Andy Fields. 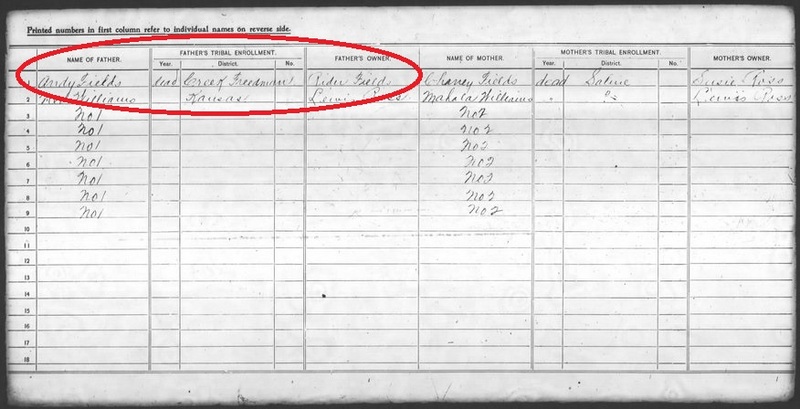 The Dawes Census cards for Andy's sons reveal something interesting. Andy Fields, former slave of Rider Fields, was considered a CREEK Freedmen. Though Rider Fields was a "Cherokee by blood", he surrendered his Cherokee Nation citizenship when he moved to the Creek Nation. Any slave of his would have been considered a Creek Freedmen. Katie Vann was a Cherokee Freedmen. She would not have had rights to Cherokee citizenship if she'd have been Rider's slave. 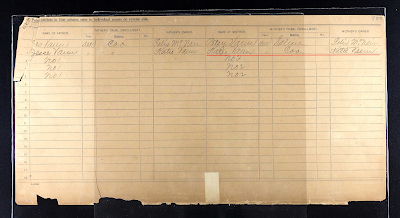 He didn't return to the Cherokee Nation until two years after the Cherokee slaves had been set free. None of the evidence uncovered at this point in time substantiates Ben Vann's testimony given in his Eastern Cherokee application. In fact, the evidence uncovered at this point in time contradicts Ben's testimony. 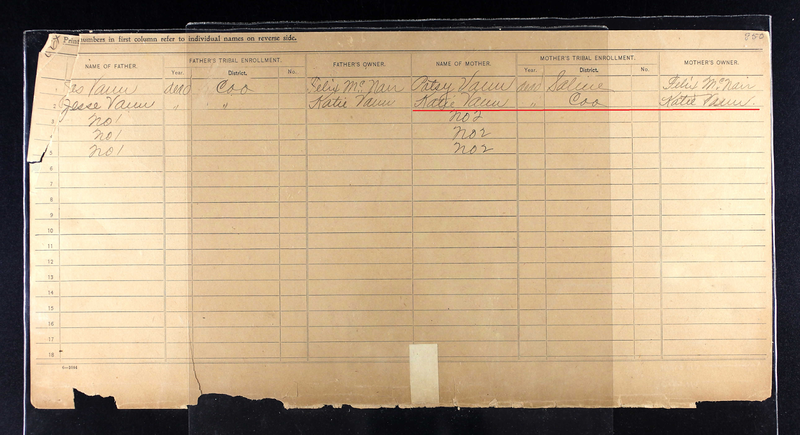 Ben Vann was a slave, as indicated on his Dawes Census Card and other Cherokee Nation rolls where he is listed as "adopted colored." 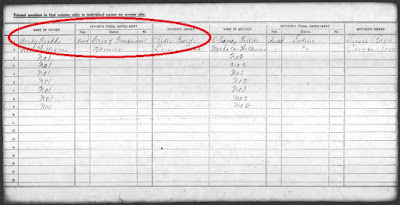 Katie Vann, mother of Ben Vann, was a slave, as indicated by three of her children on their Dawes Census Cards and other Cherokee Nation rolls where she was listed as a "Freed Person" or "adopted colored." Richard Fields was the brother of Rider Fields, not the father. 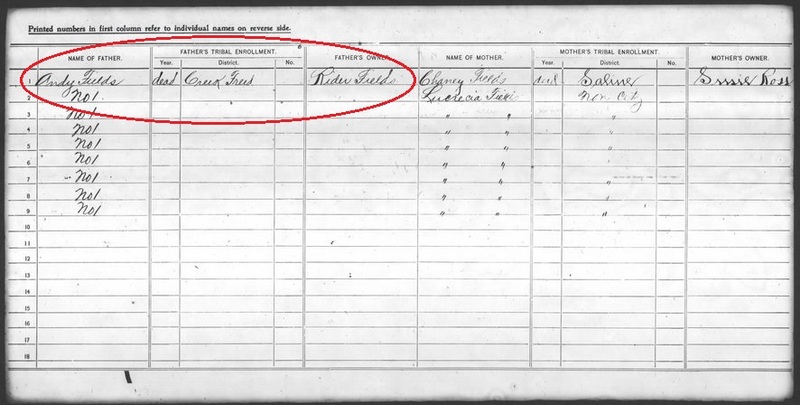 Therefore, even if Rider was the father of Katie Vann, Richard would not be Ben Vann's great grandfather. Katie Vann, mother of Ben Vann, might not have had any siblings, but Catherine, daughter of Rider Fields, had at least 6 sisters and that fact is well documented. As genealogists, we must weigh each source for its quality, credibility, and strength against other sources, information, and evidence. How much weight should we give to the testimony Ben Vann gave in his Eastern Cherokee application? That testimony by its very nature is not unbiased. Ben was a claimant and had something to gain. Having something to gain does not automatically make him dishonest, but it does mean we must use the information provided in context with why that information was given. It was given in an attempt to get money. Ben's testimony was only a claim. It is not evidence proving a claim. In order to conclude that Rider Fields was the father of Katie Vann, evidence to support that claim independent of Ben Vann's testimony is needed. There is none. After reviewing hundreds of records that provided direct, indirect, and negative evidence, it appears the only conflicting information uncovered during the exhaustive research is the testimony of Ben Vann. Let me repeat that. The only conflicting evidence to hundreds of other documents and sources is the testimony of Ben Vann. The only reason anyone claims Rider Fields was the father of Katie Vann is because Ben Vann said it. Had he not made the claim, no one would have anything else upon which to base their belief and this story would likely not be prevalent today. Someone found one document that supported what they wanted to believe and that was the end of their "research." To quote the premier genealogist of our time, Elizabeth Shown Mills, "Finding random documents to support what we want to believe is not research. It's self-delusion. 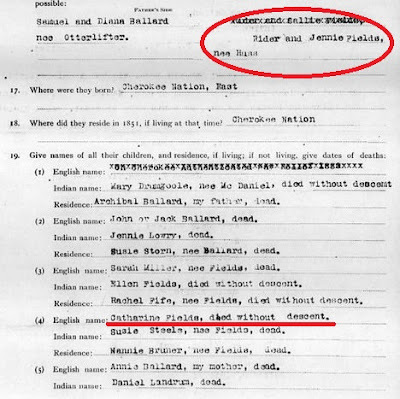 Family tales, beloved or otherwise, carry no credibility unless they meet common standards for family history research..."
If Katie Vann's descendants want to make the claim that they descend from Rider Fields, then they are responsible for providing proof of that claim. This family tale only carries credibility if it meets the common standards for family history research. At this point, it does not. 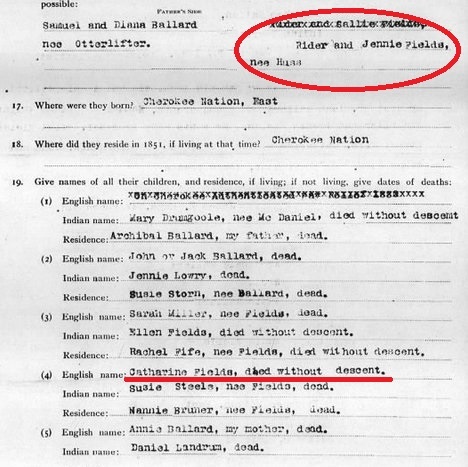 There is no credible evidence to support the claim that Katie Vann, Cherokee Freedmen, was the slave or daughter of Rider Fields, Cherokee by blood.